The Blue Blazes is the first book in a trilogy from the popular and prolific penmonkey Chuck Wendig, with the second book, The Hellsblood Bride, due at the start of 2015. In it we are introduced to Mikey “Mookie” Pearl, a soldier for The Organisation – a powerful crime syndicate that keeps New York’s assorted gangs in check, and which also happens to be the only thing standing between New York and the hellish underworld beneath. Mookie is a big man, which comes in handy when smashing goblin heads together. How big? Well, if you were to gaffer-tape Arnie, Stallone, Van Damme and Lundgren together into a single hulking, sinewy mass of muscle, then you’d be in the right ballpark. So, yeah, Mookie’s a big fella, and he’s about to hit upon a series of big problems. His teenage daughter, Nora, forever pissed off with her Dad, is making waves in the criminal underworld in the guise of her alter ego, Persephone, and she is determined to either bring Mookie to heel or to bring him down. Things take a turn for the worse when The Boss of The Organisation reveals he is dying, a revelation that, if made public, would invite a power play that would destabilise the uneasy treaty between New York’s assorted gangs. And then there are the growing attacks from assorted horrible creatures from below, from goblins only too happy to lay eggs in your warm bits to wraith-like phantoms that stab thoughts and memories from their victims. For those unfamiliar with Chuck Wendig and his writing, let me try to describe it. Imagine a barbecue upon which there sizzle a tasty array of quarter-pounders, sausages, a couple of corn cobs and one of those big mushrooms. Then imagine someone comes along and slaps a whopping forty-eight ounce steak on the grill, dwarfing everything else on it, and marinaded in the most insanely hot chilli sauce. Once cooked they then drench it with even hotter chilli sauce and serve it up with a side order of another forty-eight ounce steak. That, folks, is Chuck Wendig. We’re talking big. We’re talking strong flavours. And while The Blue Blazes is about as subtle as a pyroclastic flow through a primary school, it is nonetheless ridiculously entertaining. It’s like reading a long-lost Paul Verhoeven film created somewhere between Robocop and Total Recall. Bold is the word here, from the characterisation to the dialog and set pieces, and such unashamed comic book styling forms a large part of the book’s charm. But there’s more. The jokes hit home when they need to. The action is riotous and blood-thirsty. The horror is icky and uncomfortable when it needs to be. Wendig’s New York and the sprawling underworld beneath it are well-realised and strangely believable. The structure of the book is spot-on too, with each short chapter prefaced with an excerpt from a pioneer’s journal to help the reader keep up and to also flesh out the immediate story ahead. It all helps make this a mighty smooth read and the pages fly by so quickly you risk friction burns on your fingertips. And yet for me it is not a five star book. Why? Well, there are a handful of reasons. First: Nora, as Persephone, giving the criminal fraternity what-for – I can get behind that. What I struggle to believe, however, is that nobody in New York’s underworld knows Nora is Mookie’s daughter. Mookie is a high-ranking operative in The Organisation. I don’t care how careful he has been, it would be highly improbable for him to hide his family from his “other” family. Second: the story seems to break its own rules. The Blue Blazes is a drug-like mineral rubbed onto the temples to enhance a user’s strength, stamina and perception, like some kind of computer game power-up. When “Blazing” a human’s third eye is also opened to view the world anew and to see some people for what they really are: children of the underworld, for example, or maybe one of the maligned half-and-halfs. Think John Nada putting on the shades in “They Live”. But this additional property of Blazing, not to mention its addictive qualities, seems to be largely forgotten around halfway through the story. Humans just get to see those gruesome buggers whether they’re Blazing or not, and the Blue no longer seems to have any adverse after-effects. Finally, and this isn’t really a plot hole, there’s Nora herself. Frankly someone should have thrown her down a well and filled it in with concrete afterwards. While her existence and actions were integral to the plot, her “annoying teen with Daddy issues” act was a bold flavour too far, and the conflicting insights into her mind felt at times like she was panel-beaten to fit into the story. While I found these niggles irksome, they didn’t really derail me from the story. 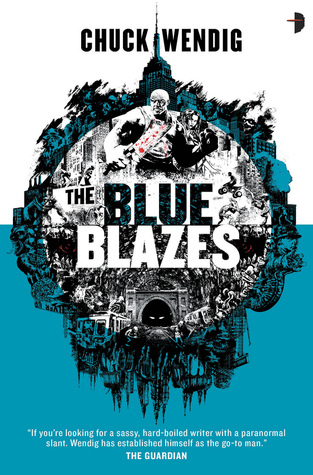 If you are willing to let these kind of gremlins whizz on by at a hundred miles per hour and to go along for the ride I would heartily recommend The Blue Blazes. It’s enormous fun and I look forward to book two. This entry was posted in Books, Reviews and tagged books, chuck wendig, reviews, the blue blazes, urban fantasy by Lucian Poll. Bookmark the permalink.